Starting off very soon after the events of the film, The Amazing Spider-man opens with a first person, mostly on-rails laboratory tour of Oscorp, which will feel suspiciously familiar to anyone who has played Deus Ex: Human Revolution. Peter Parker ‘sneaks’ through the labs with girlfriend and Oscorp employee Gwen Stacy, looking for proof of continued cross-species experiments, which created rather a lot of hassle in the movie. Sure enough, they find their proof, but not long before somebody finds them - luckily, that somebody is Alistaire Smythe, head of Research and Development. He takes Gwen and Peter on a short tour of the cross-species labs, revealing that they are in the process of disposing of the creatures, which are locked up in cases for transport - although not for long. Reacting violently to Parker (as he is a cross-species), they break out of their cages and begin attacking workers, including Gwen, who is infected with the cross-species virus and taken into quarantine. This is where we step into the Spidey suit and begin battling some mutants. Despite what the intro would have you believe, The Amazing Spider-man is entirely in third person, which does make that sequence seem slightly out of place. I can only assume that this was done so as to better control what the player looks at - and probably so a Peter Parker character model didn't have to be created. The storyline works well enough, with Peter trying to get a cure for Cross Species Virus-infected Gwen, and there's a few plot twists to keep you on your feet. It was definitely the right choice to set the game as an epilogue, as it removes a lot of restrictions that come with retelling the film in game form. The writing is cheesy but humourous, and voice acting is fair by the film stars' replacements (though delivery can be poor in places). 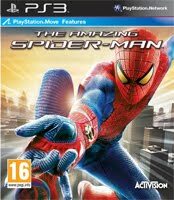 For the first time in a Spider-man game for a long time, The Amazing Spider-man sports an open world Manhattan that can be explored fully from the outset. This allows you to simply swing around the city, enjoying the sights, collecting comic book pages, or stepping in to stop petty crimes. It adds a little bit to the game, and the city functions well enough, with pedestrians and vehicles moving around and occasionally stopping to look at Spider-man if you get close enough, but barely any of the main story takes place here. The open world just acts as a large hub for swinging across to your next mission inside. Manhattan also reveals one of Amazing Spider-man's more controversial features. Web-swinging is already extremely simple - requiring you only to hold down a button and point the stick in the desired direction - but Spider-man is also able to swing above buildings. Sure, it makes traversing the city easier, but it shouldn't really work. Otherwise, swinging through the city streets is really enjoyable, with motion blur and the whistling wind giving a real sense of speed. Inside however, swinging is far from ideal, especially with some dodgy camera movements, so players can instead use Web Rush. This mechanic slows time to an almost complete halt for a short period, and allows a first person view. While in this view, you can see glowing silhouettes of yourself showing optimum points to Rush to. Releasing the Web Rush button sends you quickly to your selected destination. Gameplay is a mixture of web-swinging, crawling around on walls and ceilings, stealth, and fighting enemies. Wall-crawling aside, it's very similar to Rocksteady's Batman: Arkham Asylum series. A lot of the gameplay is almost directly copied. Basic thugs can easily be taken on with free flow combat moves, occasionally countering when your Spidey Sense tingles, and building up your combo allows you to pull off Signature Moves to do more damage. Sometimes, enemies wield knives, batons or riot shields, that require you to first stun them or vault over them to do some damage. Guns will result in a quick death if you just run in, so a room full of assault rifle wielding thugs requires some roof-scampering stealth takedowns, swinging from place to place, and then dropping down on unsuspecting enemies. Bodies will alert other thugs if you're not careful, so you need to pick your Takedowns carefully. The developers themselves acknowledge their 'inspiration' from the Arkham games and it's hardly surprising that they wanted to emulate this gen's best superhero game. To be honest, it's not necessarily a bad thing, as it works well and looks good, although it is noticeably less refined than Arkham. To improve your abilities further, there are two sets of skill upgrade trees, which allow you access to new moves and abilities, once you've unlocked them from side missions. This gives you extra incentive to venture outside the primary missions, but, while some of the upgrades are pretty useful, they aren't needed to finish the game and can be avoided altogether if you wish. All of this will last you around 7 hours, but once you've completed the main storyline there's not much left to do in the city. Even if you keep yourself amused with the repetitive crime-stopping and civilian-rescuing, after a while you'll clean up the entire city and it doesn't seem to regress, leaving you an entire Manhattan devoid of objectives. Graphically, the game is a mixture. Animations are superb, with fluid, free-flowing combat moves and web-swinging, but aliasing is a persistant issue in a game filled with buildings that are, unfortunately, covered in straight lines, and object pop-in does also occur occasionally while swinging through the city. One key shortcoming of the game is sheer lack of variation. Inside areas - where most of the game takes place - are all similar, and there's only a few enemy types that you'll be battling outside of the much more interesting boss fights. Missions are very samey as well. Overall, The Amazing Spider-man is definitely one of the better film tie-in games I've played, with a decent campaign and enjoyable gameplay mechanics. However, it suffers from being a fairly short experience, sports an open world with little to fill it and simply lacks variety. Perhaps if the game hadn't been pushed to match the movie's release issues could have been ironed out, so I'm definitely looking out for Beenox's next Spider-man title.